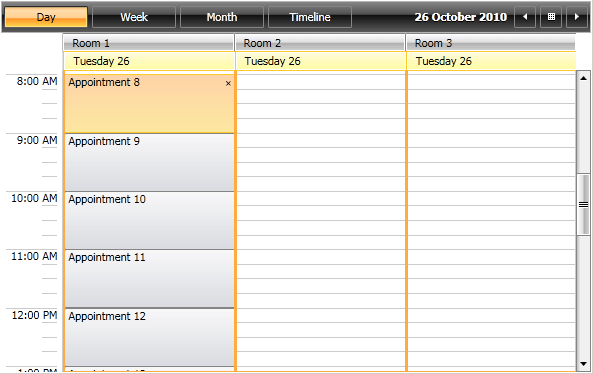 The RadScheduleView allows you to define custom resources that can be assigned to the appointments. Custom resources let you associate additional information with your appointments, where the information for each field can be selected from a limited number of possibilities. For example, you can load the appointments of different users on a single scheduler by simply choosing the name of the user from a drop down. The same applies for various resources such as meeting rooms, team events, etc. Because custom resources have a limited number of values, RadScheduleView can group appointments based on the resources associated with them. For example, you can book different facilities for a variety of events. 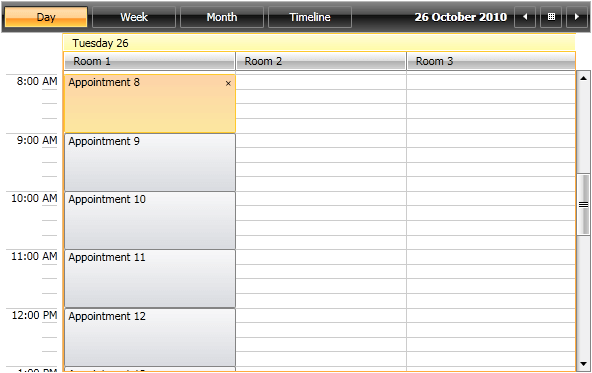 Also, the appointments can be grouped by multiple groups. If you want to be able to set an appointment to multiple resources you need to set the AllowMultipleSelection property of the ResourceType to true.